Where does the swim actually occur? The swim takes place in the Atlantic Ocean at the Princess Royale Oceanfront Hotel on 91st Street in Ocean City, Maryland. Does the swim really start at 1:00 PM? Event day registration will begin at 10:00 AM and end at 12:30 PM in the Premier Lobby in the lower level of the hotel. The swim will start promptly at 1:00 PM. The swim and awards ceremony should be complete by 2:00 PM. How cold will the water be? Yes! You can wear a wet suit, a crazy costume, or a good, old-fashioned swim suit. Just be sure you come prepared with a way to get warm following your “swim”! I want to participate, but I don't want to swim. Do I really have to swim? Getting your toes wet will count! You can become a team captain and form a team with your friends and family, join an existing team, or participate as an individual. Everyone is welcome! Your business or organization can get involved by forming a corporate team and/or becoming an event sponsor. I'm a business owner and would like to become a sponsor. What are the sponsor levels? There are five levels of corporate sponsorship: Glacier Sponsor: $5,000; Iceberg Sponsor: $2,500; Igloo Sponsor: $1,000; Icicle Sponsor: $500; Snowflake Sponsor: $100. The Penguin Swim has grown exponentially with more than 1,000 participants and has tremendous reach via social media. All sponsors are listed on our event website, AGH’s Facebook pages, on a sponsor banner at the event, and recognized in all press and social media up to and following the event. All sponsorships include ads in our Event Program that will be distributed to all participants. What is the minimum amount for a donation? There is a minimum donation amount of $25.00 required in order to participate in the swim. All registered participants will receive an official 2019 Penguin Swim short-sleeve t-shirt! Pre-register by December 1st to guarantee size. What are the incentive prizes this year? The incentive prizes are based on each registered participant’s Individual Level of Fundraising. The $25 registration fee is included in your Individual Fundraising Level total. Check out this year’s prizes! What kind of awards can I win? 1st, 2nd, and 3rd Place trophies are awarded to highest fundraising Teams in three separate divisions for Business Teams, Community Teams, and Youth/Family Teams; and for highest fundraising Individuals in two separate divisions for Adults and Youth (18 and Under). Awards are given to the youngest and oldest Penguins. There is a Costume Contest, too, so feel free to be creative! What if I'm on vacation and can't attend? Join us for the Cyber Swim! Register and fundraise as an individual penguin or as part of a team. 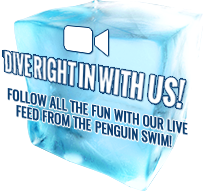 Then jump into the water where you are, take a photo and share it with the Penguin Swim’s online community on Facebook, Twitter, and Instagram using #OCPenguinSwim. *Make sure your post is public so we can see it! You will still be eligible for incentive prizes based on your individual level of fundraising. What are the Terms and Conditions set forth in the Release and Waiver for this event? In consideration of participating in the Atlantic General Hospital Foundation’s Annual Penguin Swim. I represent that I understand the nature of the Penguin Swim events and that I and/or my minor child am qualified, in good health, and in proper physical condition to participate in such Activity. I acknowledge that if I and/or my minor child believe event conditions are unsafe, I and/or my minor child will immediately discontinue participation in the Activity. I understand that alcoholic beverages and glass containers are not allowed on the beach. I fully understand that Penguin Swim events involve risks of serious bodily injury, including permanent disability, paralysis and death, which may be caused by my own actions, or inactions, those of others participating in the event, the conditions in which the event takes place, or the negligence of the “Releasees” named below; and that there may be other risks either not known to me or not readily foreseeable at this time; and I fully accept and assume all such risks and all responsibility for losses, costs, and damages I and/or my minor child incur as a result of my and/or my minor child’s participation in the Activity. I hereby release, discharge, and covenant not to sue Atlantic General Hospital, Atlantic General Hospital Foundation, its respective administrators, directors, agents, officers, volunteers, and employees, other participants, any sponsors, advertisers, and, if applicable, owners and lessors of premises on which the Activity takes place, (each considered one of the “RELEASEES” herein) from all liability, claims, demands, losses, or damages on my account caused or alleged to be caused in whole or in part by the negligence of the “Releasees” or otherwise, including negligent rescue operations; and I further agree that if, despite this release, waiver of liability, and assumption of risk I, or anyone on my and/or my minor child’s behalf, makes a claim against any of the “Releasees”, I will indemnify, save, and hold harmless each of the “Releasees” from any loss, liability, damage, or cost which any may incur as the result of such claim. I have read this RELEASE AND WAIVER OF LIABILITY, ASSUMPTION OF RISK, AND INDEMNITY AGREEMENT, AND PARENTAL CONSENT AGREEMENT, understand that I have given up substantial rights by signing it and have signed it freely and without any inducement or assurance of any nature and intend it be a complete and unconditional release of all liability to the greatest extent allowed by law and agree that if any portion of this agreement is held to be invalid the balance, notwithstanding, shall continue in full force and effect. I give my permission for photographs taken at the event in which my image or the image of any of my minor children appears, to be used for promotional and/or advertising purposes by Atlantic General Hospital Foundation, their media partners or “Releasees” included above without compensation to me or my minor children.